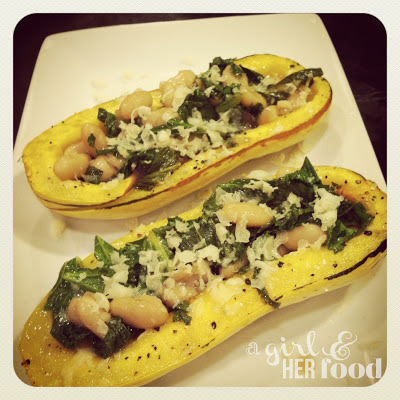 Delicata squash is the most under-rated squash. Delicata's exterior is pale skin and green striations and it has a mild taste, but a bit sweet. I love all winter squashes, but with this squash you can eat it's skin. It's delicious! Delicata squash is full of Potassium, Iron, and Vitamins A & C. I like to make this as a vegetarian meal but feel free to adapt meat or pancetta to this. Preheat the oven to 350 degrees. Cut the delicata squash lengthwise and scoop out the seeds. Brush the squash with olive oil and season it with salt and fresh ground pepper. Place the squash in a baking dish and roast in the oven for about 20-25 minutes or until fork tender. Remove from oven and let it slightly cool. In a saute pan, heat the olive oil over medium heat. Add the minced garlic and cook it for about 1 minute. Add the kale, cooking with for about 3 minutes, and making sure to stir it frequently. Add the cooked beans to mixture and season with salt and pepper. Set aside until the delicata squash is roasted or begin filling the middle of the squash with the white bean-kale mixture. Sprinkle the top with the shredded Parmesan cheese and place in oven for about 5 minutes or until cheese is melted.